Get ready for the Live Blackjack. The most widely known casino game ever is now available online in the exclusive live Blackjack version that is offered by several new online Live Casinos. The Blackjack, or the twenty-one game also referred, is a simple game based on luck but there are also some basic strategies that one should follow in order to win. The main idea of Blackjack is that there is a player versus the dealer and the goal is to defeat the dealers hand by accumulating a hand of greater value than the dealer’s hand and which does not exceed 21. This popular casino game does not have a standard history or origin, but records claim that we have the first form of Blackjack around the 17th century with the name of twenty-one card game in Spain. Later, references of this game claim that it was also spread in France. As soon as the twenty-one card game was introduced in the US, there where bonuses announced by several gambling houses in order to draw the players’ interest into the game. An extreme 10 to 1 payout bonus took place rewarding the player’s hand that consisted of the ace of spades and a black jack (i.e. the jack of spades or the jack of clubs). This hand was called a “Blackjack” and it remained that way for the game’s name even though the extreme 10 to 1 bonus soon disappeared. Live Blackjack, the most popular casino game ever, can be found in casinos offering infinite hours of online play and responsible gambling. Live dealers will welcome you and the amazing Live Blackjack card game will start at once. Do not hesitate and visit the following links in order to join the superb Live Blackjack feature. The Blackjack is a simple game but when it comes to high stakes, all players should have the following data in mind. For beginners, the most important thing is to know the value of the cards. For the number cards, their value is the same as the number stated, for the face cards (Jack, Queen, King) their value is 10 and the Ace’s value can be 1 or 11 depending on the hand. 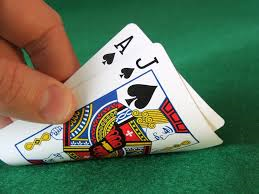 For the actual play now, at the beginning of the round, the player and the dealer are both dealt of two cards. The players cards are both placed faced up on the table while the dealer has only one card faced up and the other faced down. If the player has a blackjack then he wins automatically, apart from the case that the dealer also owns a blackjack where we have a push. After the deal of the cards (without any blackjack on the table), the player is given the option to use any of the side rules (explained below) he might want. Next thing, is to either hit (request for another card) or stand (keeping your remaining cards without drawing). A player can draw cards as long as their total sum is less than 21. In case that this exceeds, then there is a burst and the player loses. When the player is done, then it is the dealers turn. He flips the faced down card and checks the total sum. If it is 21, then the dealer wins. If it is less than 17, then the dealer is obligated to draw another card. If it is greater than 17, then the dealer stands. If the dealer exceeds 21, then the player automatically wins. Take Insurance – At specific hands, when the dealer reveals an Ace, a player is allowed to bet on whether the dealers hand is a blackjack or not. This is called an insurance bet and it is equal to your original bet. If you win the insurance bet, you get 2-1 back and since the fact that you lost your original bet, you will end up even in the end without losing any money at all. This might sounds cool, but strategy guides advise against the option of insurance in Blackjack. Surrender – In this case, the player is allowed to surrender his hand and reclaim half of the original bet. The other half is lost however. When a player presumes that his hand is weak and it will probably lose, then he can ask for surrender and the round goes uncontested. Double Down – In the case that a player presumes that his hand is strong and it will definitely win, he can double the original bet. If he chooses to do that, then you are allowed to draw only 1 more card. Splitting – When the player is dealt two same value cards, then he is allowed to split his hand and play with two hands separately. The original bet must be put into the split hand of course and the dealer deals one card for each hand at once. Consequently, he has two pairs of two cards that will be played separately and has the chance to win or lose double the amount of the original bet. When it comes to bet in Live Blackjack, a player should be aware of the following betting conditions. In the table, there is a minimum and a maximum bet placed by the casino. Most of the time, the maximum bet is 10x or 20x of the minimum. Meaning that a table with a minimum bet of 10£ can have a maximum bet of 100£ or 200£. The player can either win a hand and claim a double up for his bet, lose a hand and lose his bet or get a push meaning that we have a draw and the player gets his bet back without any loss. In case that a player gets a blackjack (21), then he earns 1,5x his bet. Even though the Live Blackjack card game is one of the latest trends of the market, there is no doubt of the top quality professional approach that characterizes it, during the fact that the best software gaming developers of the market have provided their top knowledge for the setup of this marvelous new feature. Many of the online slots and casino game developers are offering some kind online baccarat game, the most known of them are NetEnt, Microgaming, Playtech and Betsoft.